Two years on from the peak of the “refugee crisis” in Greece, the Greek state is beginning to take over management and financing of aspects of the reception and integration system, and many international nongovernmental organisations (NGOs) that came to assist with the then-humanitarian emergency are downsizing or preparing to exit the country entirely. 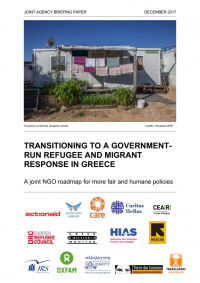 At this turning point, the 14 undersigned NGOs believe it is critical to reflect on our field experiences, build on the progress collectively made, and provide recommendations for a smooth transition and a sustainable Greek Government-managed refugee and migrant reception and integration system. The transition to a government-run response is a positive step if implemented transparently, promptly, and in close collaboration with local governments, as well as the organisations currently providing services, soon to fall under the responsibility of the Greek Government. It is under this current state of affairs, and with the goal of preventing regression, that we write this report.